Although this past week took the S&P 500 Index return for the year into negative territory (down 3.2%) any positive stock returns have been led by only a handful of stocks. 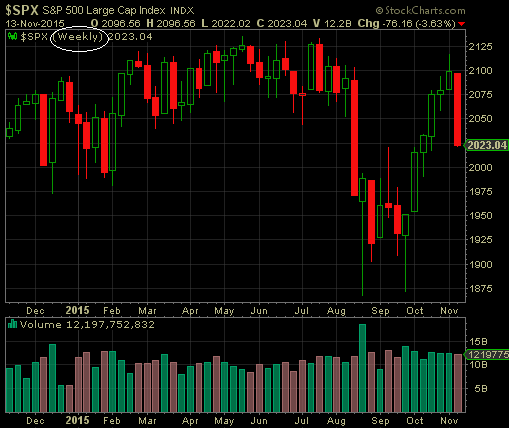 For the week, the S&P 500 Index declined 3.7% and was the first weekly decline after six weekly gains. "five S&P 500 firms – Amazon (AMZN), Google (GOOGL), Microsoft (MSFT), Facebook (FB), and General Electric (GE) – account for more than 100% of the index total return YTD prompting client inquiries regarding narrow market breadth. The Goldman Sachs Breadth Index currently equals 1, one of the lowest readings in the 30-year series. Our index has experienced only 11 narrow breadth periods since 1985, including three during the late 1990s that share several characteristics with the current narrow breadth episode. The typical episode lasted 4 months and strong balance sheet, mega-cap, and high momentum were factors that outperformed. The current period is one month old and may last into early 2016." 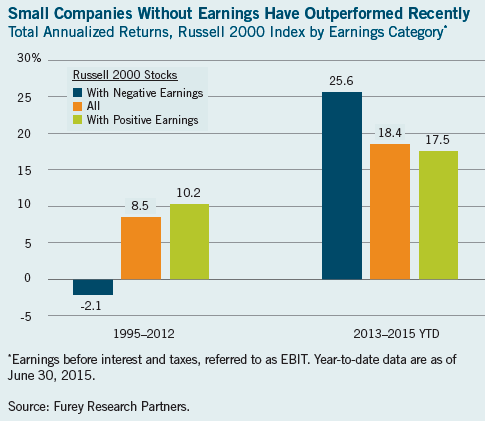 In addition to the narrow leadership in the large cap space, T. Rowe Price notes small cap stocks without any earnings have been outperforming those companies that have earnings as represented by stocks in the small cap Russell 2000 Index. This narrow market leadership along with the outperformance of companies with no earnings has contributed to some of the market's recent volatility. Additionally, the recent volatility is playing a part in the spike in bearish sentiment. 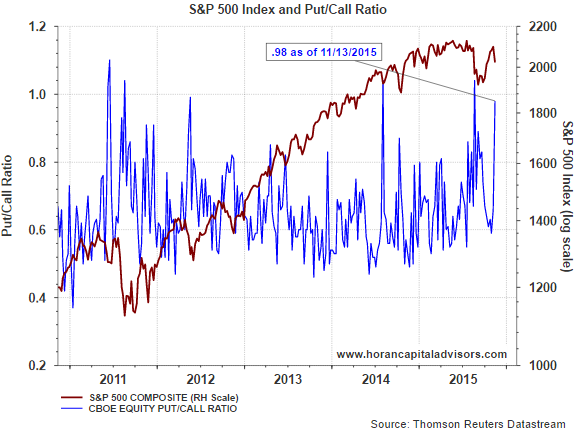 As can be seen in the below chart, the CBOE equity put/call ratio jumped to .98 as of Friday's market close. As noted in prior posts, put/call ratio readings above 1.0 are most predictive of overly bearish sentiment and is indicative of a market that has the propensity to rally.